A light perfecting lotion formulated to balance a sensitive, oily or blemish prone skin. A blend of Organic Willow Bark, Clove Essential Oil, Organic Juniper and Organic Cayenne helps regulate oil production while Organic Lavender and MSM promote blemish healing. This corrective hydrator soothes and clarifies without dryness, irritation or redness. 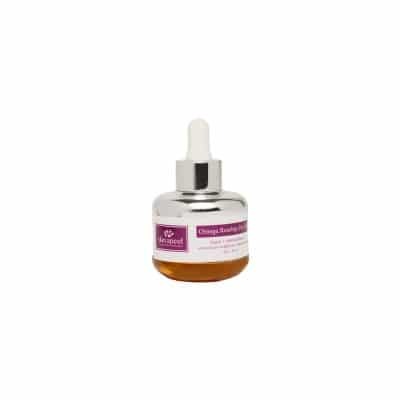 Non-comeodogenic and oil balancing to keep a sensitized skin from over-working. Apply twice daily to cleansed and toned skin. May be applied over skin apeel serum. Avoid eye area. Rinse well if irritation occurs. (97.5% Naturally Derived/52% Organic) Ingredients: Organic Lavandula Augustifolia (Lavender Distillate), Organic Aloe Barbadensis Leaf (Aloe), Sodium Stearate, Kosher Vegetable Glycerin, Organic Cocos Nucifera (Coconut Oil), Cetyl Alcohol, Methylsulfonylmethane (MSM), Organic Amygdalus Dulcis (Sweet Almond Oil), Wildcrafted Salix Alba (Willow Bark), Sodium Ascorbyl Phosphate (Vitamin C), Eugenia Caryophyllata (Clove Essential Oil- for effect, not for smell), Wildcrafted Juniperus Communis (Juniper Extract), Organic Capsicum Annuum var.Aannuum (Cayenne Extract), Panthenol (Vitamin B5), Prunus Armeniaca (Apricot Kernel Oil), Phenoxyethanol, Ethylhexyl Glycerin, Lavender and Lime Essential Oils.